The first book in this series was a delightful surprise. (Read review here.) This book continues the adventures of Kara and Mai – Majat (Assassins). There’s a quick recap of the important events of the first book – something I wish would be done with much more regularity in publishing for those of us who may start with the middle book of a series from time to time. Kara and Mai both have a tremendous sense of honor and duty. Kara is prepared to sacrifice herself in the line of duty for her prince (a young boy). Mai is recalled to the Guild of Assassins to face judgment for his not killing Kara. But Kara accompanies Mai to the Guild and despite the clear and present threat to her life for doing so, stands by Mai as he issues a challenge against the best assassins. Mai and Kara become much too familiar with politics and the underhanded business of going against what a leader wishes, but manage to come out on top after each (nearly) sacrifices their life for the other. (Yes, I’m being a little cagey in order to not give anything away. Author Anna Kashina’s writing is very smooth and this book is a quick and easy read But the plot…? An awful lot happens here without actually having much happen. We spend a lot of time – a LOT of time – with Kara and Mai fighting against their much too obvious affection for one another while fighting alongside one another. They make Sam and Diane (of Cheers fame) look absolutely steady. There is some story here, and Mai manages to rise in the ranks very swiftly, but really this book has the classic second-book feel to it. It’s a place-holder – a lure to book three and not much more than that. I have book three ready to go and I hope that we can get back to some serious story-telling instead of the insidious romance-hiding-behind-epic-fantasy veil. Looking for a good book? 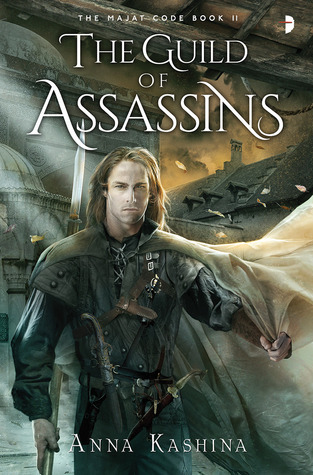 The Guild of Assassins by Anna Kashina reads like a YA romance instead of the epic fantasy that was being promised through the course of the first book in the series.